Did you know? 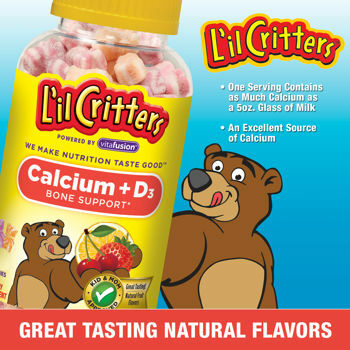 One serving of L'il Critters™ Calcium Gummy Bears contains as much calcium as a 5oz. glass of milk. L’il Critters™ Calcium does not use FD&C Red #40, Blue #1, or Yellow #6. Take only as directed. Do not exceed suggested dosage. If your child has a medical condition or is on medication, please consult a physician before using this product. Not recommended for children under two years of age due to choking. Do not use if inner seal is broken or missing. This product may settle during shipping. Do not expose to excess heat or moisture. Colors will fade over time. This does not alter the potency of the product. Keep out of the reach of children.